The world’s longest waterslide is dug into a hillside in Waimauku near Auckland, New Zealand. Only 2000 people will have the honour of riding the waterslides, with one measuring 650 meters long built by New Zealanders Jimi Hunt and Dan Drupstee, of the “Live more Awesome” charity last weekend. The world’s longest slide was open for only two days to raise funds and awareness of depression. This entry was posted in New Zealand on 2013/02/28 by Trailsurfer. This amazing video shows how train tracks are being maintained during the winter. Kiwirail attempting to plow a route through to Christchurch today from Arthurs Pass made for some spectacular images. This entry was posted in New Zealand on 2013/02/18 by Trailsurfer. This entry was posted in New Zealand on 2012/11/01 by Trailsurfer. Air NZ OneUp programme allows passengers to bid for a cabin class upgrade on flights. Eligible for an upgrade is economy and premium economy class ticket holders who had booked directly with Air New Zealand either online, through its contact centre, or at an Air New Zealand Holidays store. If there is upgrades to be done you will receive an email inviting you to make an offer to upgrade to the next cabin class. Passengers whose offers are accepted will receive email confirmation several days prior to travel. This entry was posted in New Zealand on 2011/12/27 by Trailsurfer. More on New Zealand here. 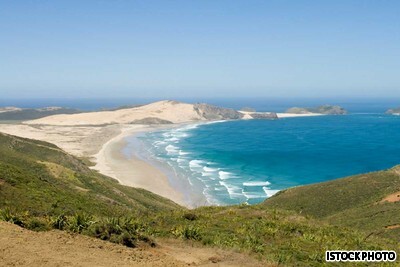 This entry was posted in New Zealand on 2011/10/12 by Trailsurfer. Active New Zealand takes it upon itself to produce an important New Zealand travel advisory video on YouTube, warning travelers and providing key things they need to know before visiting New Zealand for a vacation. This entry was posted in New Zealand on 2011/10/06 by Trailsurfer. From the golden bays of Abel Tasman to the naturally heated waters of the Coromandel Peninsula, New Zealand beaches pack as much sunshine and clean water as your dreams will allow. More pics are found here. This entry was posted in New Zealand on 2011/09/19 by Trailsurfer.